After obtaining encouraging results in 1973 with the a440 racing car, alpines objective for 1974 was racings formula two championship. The new a441 gloriously achieved this task, winning all the races it entered. Top speed of about 175 mph engine typedrivetrain: V6, 2 overhead camshafts for each cylinder bank, 4 valves per cylinder displacement 1,997 cc power rating 295 hp transmission 5-speed manual chassis: All-wheel independent susВ¬pension; Disc brakes; About 1,280 lbs. Almost a new car the a440 understeered and was too heavy. Also, the interior was so cramped that the drivers legs were wedged in hazardously. Driver guy dhotel suffered serious injuries because of this defect. For the a441, however, a larger opening was bored into the sheet-metal-and-plastic-foam dashboard cowl. The reinforced crankcase became the bearing for the suspension, and the oil-cooled radiator was moved to the front. Marcel hubert designed a narrower new body for the a441. absolute supremacy alpine built three alpine-renault a441 cars, two for its own use and one for gerard larrousse and the switzerland-archambault racing team. The alpine-renault a441 made a winning debut on the ricard-castellet course and also took first place at hockenheim and mugello. A44ls earned first and second place on the charade and misano courses and first, second and third at enna. The alpine-renault a441 racing car was truly unrivaled. 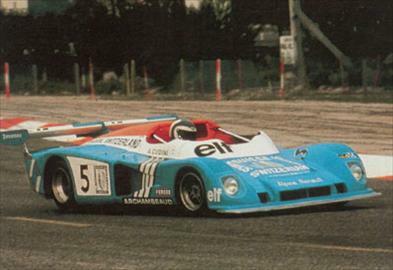 The alpine-renault a441 won the 1974 european championship for marques by winning all its races.